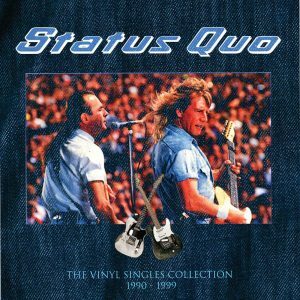 The Vinyl Singles Collection 1990-1999 is the fourth in a series of five limited edition Quo boxsets released by Universal Music. Like it says on the box, it presents 32 tracks of remastered originals, edits, short and orchestral versions of the band’s singles’ output during that decade. It’s one for collectors, but also in itself an instructive slice of Status Quo history. The nineties heralded a significantly new line up. The lawsuit with erstwhile band member, Alan Lancaster had been won by Rossi and Parfitt. They added Andy Bown, Jeff Rich and John Edwards. This was the new Quo. The band’s first big hit single of the decade, ‘Anniversary Waltz Part One’ is a microcosm of the band’s nineties output. It thumbs through pop music’s back pages . . . referencing the music of influential artists like Dion DeMucci, Chuck Berry and Jerry Lee Lewis. They were giving notice that Status Quo, a band of mega successful poprock craftsmen, knew on whose shoulders they were standing. In fact this collection is peppered by covers, cherry picked from the band’s Don’t Stop album in 1994. From The Beach Boys’ ‘Fun, Fun, Fun’, to ‘All Around My Hat’ (with Maddy Prior), to Jackie DeShannon’s sixties’classic, ‘When You Walk Into The Room’, stuff that helped form and shape the Status Quo sound. All that said, their own, self penned material stands tall in this company. We are surrounded by the heavyweight vinyl evidence . . . Top Forty hits like ‘Can’t Give You More’, ‘I Didn’t Mean It’ and ‘Rock ‘Til You Drop’ among many others, are testament to the sharp songwriting focus that Rossi, Parfitt and Bob Young brought to the table. Even or perhaps moreso, the dry humour of ‘Tilting At The Mill’ and ‘I Knew The Bride’ emphasised the band’s Anglocentric view of the world. And ironically, everyone is engaged in the remorseless pursuit of that awesome emotional moment, where pop transcends its genre limitations, and reaches an international audience. Reviewed by Brian McGowan and released by UMC 30 November 2018.